Normally when I go out of London on an art trip I plan my day with military precision. My companions are normally slightly scared by the colour-coded maps. But the week had been exceptionally busy and, when I sat down on the train, I only had four galleries on my list and it was on track to be a relaxing visit. As you may have realised though, relaxing doesn’t come easily to me and, with a two-hour train journey and good internet connection on my side, I started having a look at what else I could be visiting. And wow did I get a shock. Manchester appeared to be a veritable treasure trove of museums, galleries, historic buildings and, of course, it has a cathedral. The tourist board website lists 67 galleries – I had my work cut out. So I picked a host of things for my to-do and see list – slightly ambitious even for me considering I didn’t know my way around Manchester. I bounded off the train like an over-excited puppy and headed straight to the Whitworth Gallery as this was always number one on my list. 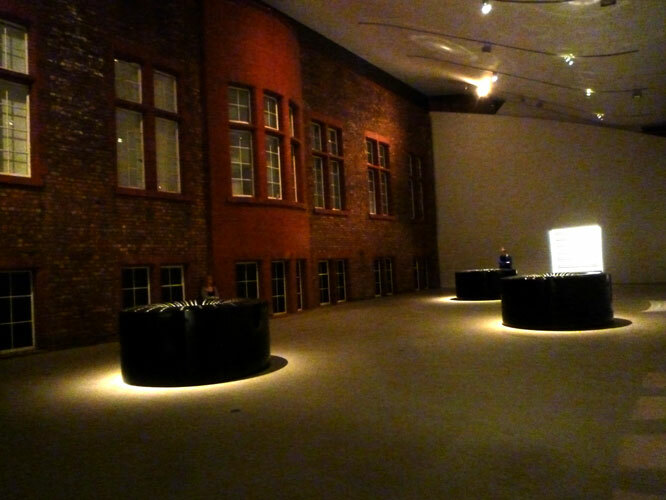 The Whitworth Art Gallery. Own photograph. 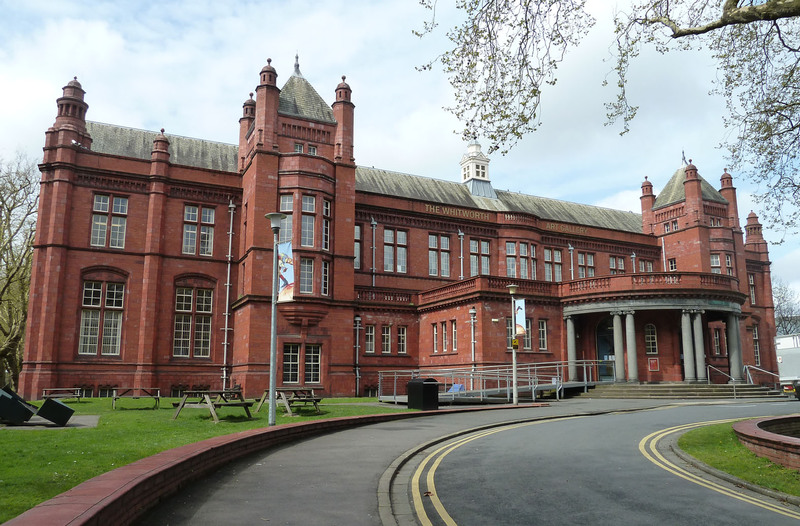 The Whitworth Art Gallery is set within Whitworth Park and is part of the University of Manchester. Currently three exhibitions are on show – COTTON: Global Threads tells the story of the production, consumption and global trade of cotton, with exhibits showing worldwide diversity that afford particularly attention to the fashion and textiles from India. This isn’t really my area of interest so, although I had a quick look, I didn’t spend too long studying the displays in depth but it is a very well-planned exhibition with brilliant movement-activated display cases that are triggered on approach. The exhibition includes Yinka Shonibare’s Boy with a Globe 4 using the Dutch wax-printed cotton that has become a trademark of his work. 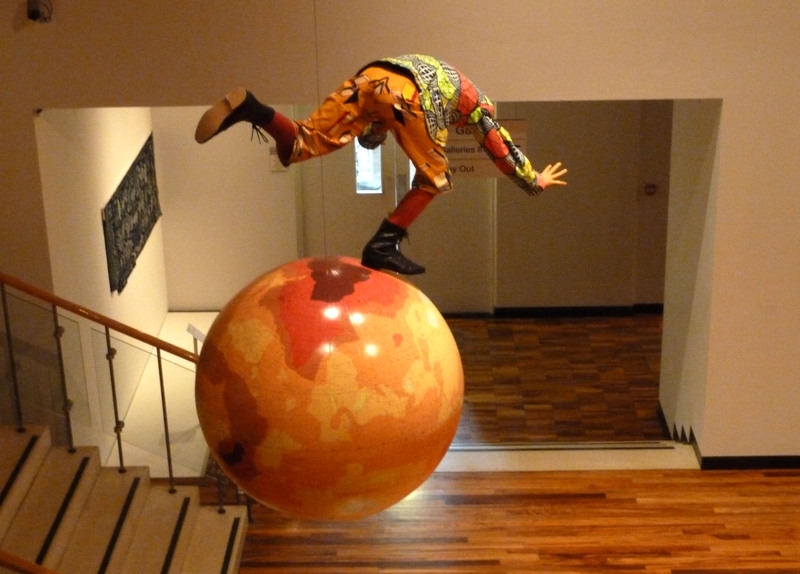 Yinka Shonibare, Boy with a Globe 4. Own photograph. 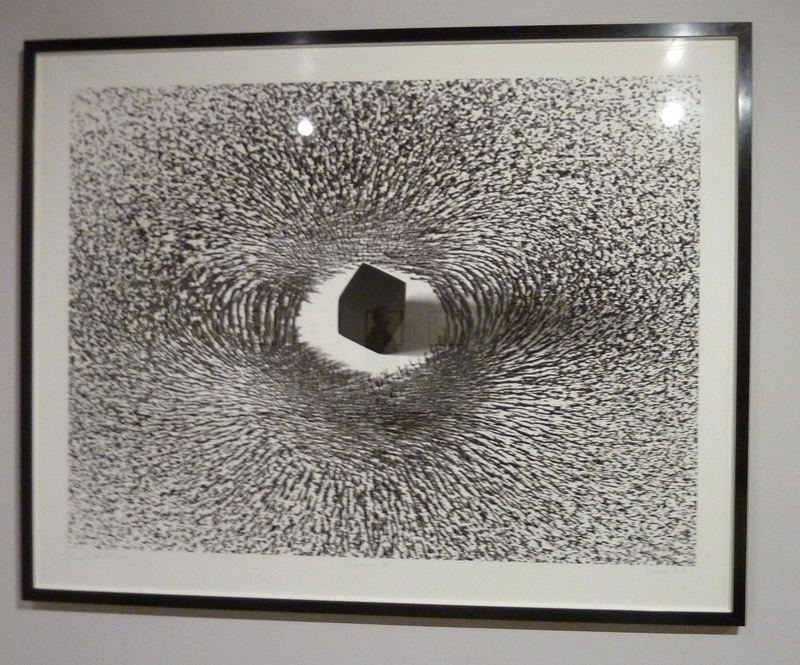 Upstairs is an interesting piece by Ahmed Mater, Magnetism IV, which evokes the feeling of the first day of pilgrimage to Mecca, when pilgrims walk around the Ka’ba seven times counter-clockwise, by using tens of thousands of iron filings placed between the fields of two magnets. A couple of galleries were closed for re-hang but there is also a small Victor Pasmore exhibition upstairs showing a series of his later screenprints exploring geometrical forms, lines and colour that suggest elegant organic movement. Ahmed Mater, Magnetism IV. Own photograph. The main reason for my visit to the Whitworth was to see Idris Khan’s The Devil’s Wall, an installation that draws on the rituals of the Hajj (the pilgrimage to Mecca). As always, Khan blurs the boundaries between the secular and the spiritual. The main elements of the exhibition are three, black, cylindrical sculptures that slope down into infinite funnels. 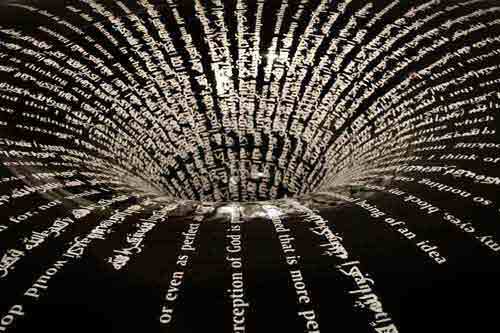 Khan has printed text from the Quran (in English and Arabic) on the works, radiating outwards, sometimes disappearing into the black holes. The sculptures reference the stoning of the Jamarat where pilgrims chant and throw seven stones at three walls in three different locations to crush the devil. Idris Khan, The Devil’s Wall. Image via www.whitworth.manchester.ac.uk. The works are very contemplative; displayed in a darkened room they evoke the voyage of self-discovery that Khan took in making these works. His parallel concepts of repetition are also seen in a series of drawings, 21 Stones, that were printed using a rubber stamp. Again making use of a circular motion they repetitively show statements from the Quran in a chant-like format. Also on show is Voices where Khan experiments with the repetitive nature of Philip Glass’s music in a series of spell-binding, tranquil works where the notes appear to move around the stave. 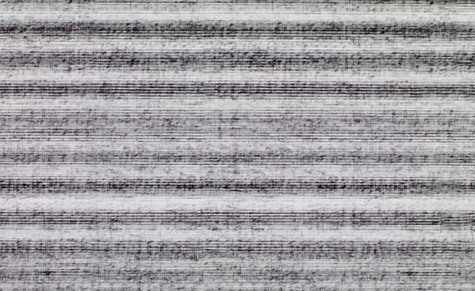 Idris Khan, Voices. Image via www.wallpaper.com. Although highly complex, Khan’s works do no alienate or intimidate. Instead, they invite people to reflect on the messages and traditions on which they focus. I don’t normally comment on the exhibition guides but this one deserves mention; it is really brilliant, clearly explaining the works without over-simplifying or over-complicating. Idris Khan, The Devil’s Wall. Image via http://margaret-cooter.blogspot.com. 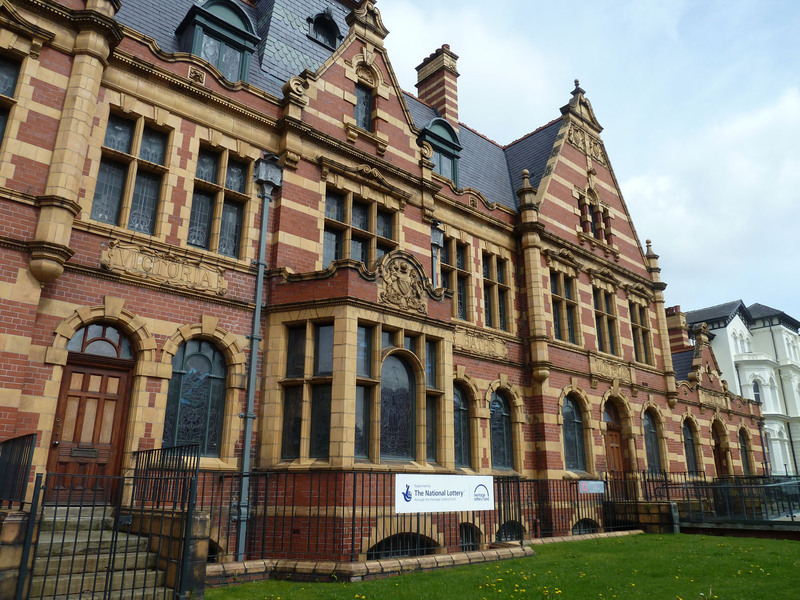 Onwards, I hailed a cab to go to see the Victoria Baths, a building that has been the focus of much heritage attention over the last few years. Opened in 1906, the Baths were then described as “the most splendid municipal bathing institution in the country” and became famous, not only for its design but for the Olympic swimmers who trained there. In 1993 the council could no longer justify the expense of keeping the baths open and a committee was formed to try to save the building. Over the years it’s been consistently in the public eye, winning the first series of the BBC’s Restoration in 2003 as well as having been awarded a considerable amount from the Heritage Lottery Fund which then became embroiled in complications. The multi-coloured brick façade is stunning and many of the original features remain. Sadly, I wasn’t around on a day when the interior was open for tours although I have seen many pictures and the potential for great arts installations in the past but it is a stunning building and I was glad to take a peek at this architectural gem. 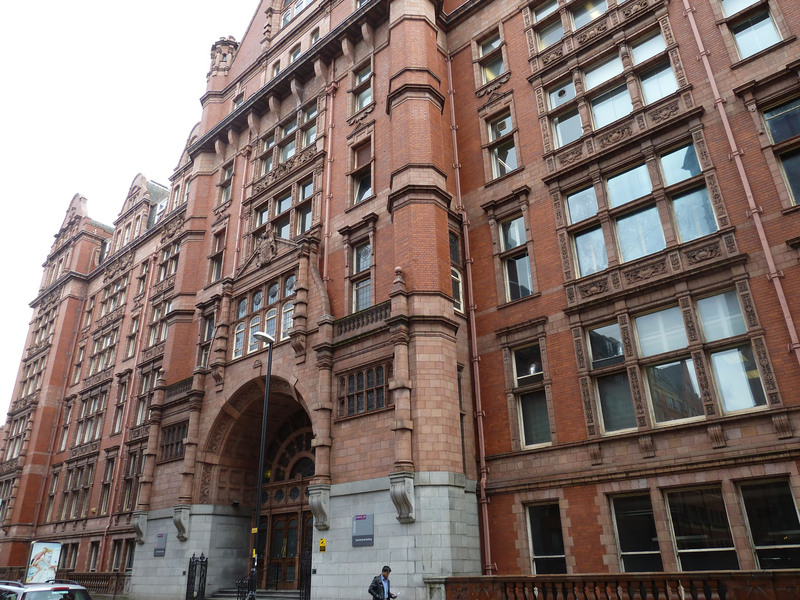 I carried on in my cab to see the UMIST building – an imposing red-brick building on Sackville Street. 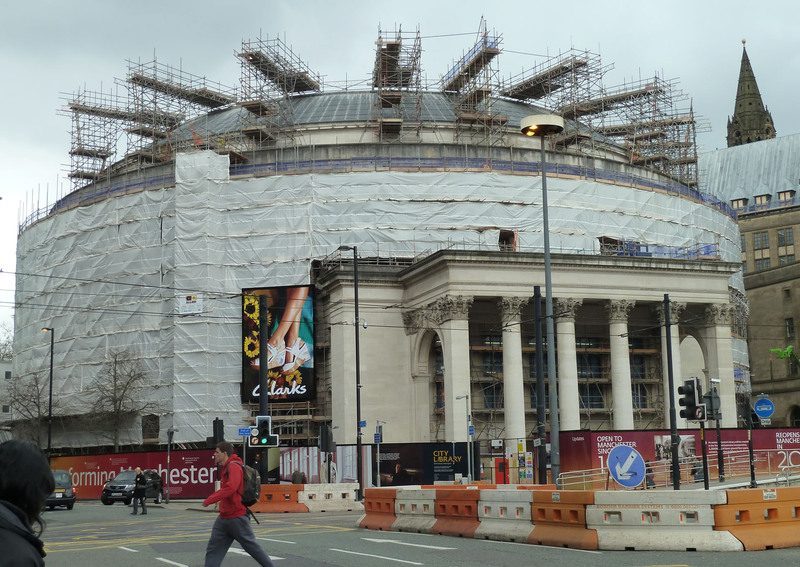 I was already gaining the impression that Manchester is architecturally a very rich city. My next stop was Cornerhouse, Manchester’s centre for contemporary visual art and film. Their current exhibition, Subversion, brings together 11 artists to rethink ‘modern’ and ‘Arab’ identity. The exhibition looks at the stereotypical preoccupations that we have come to know as, or associate with, the Arab world. 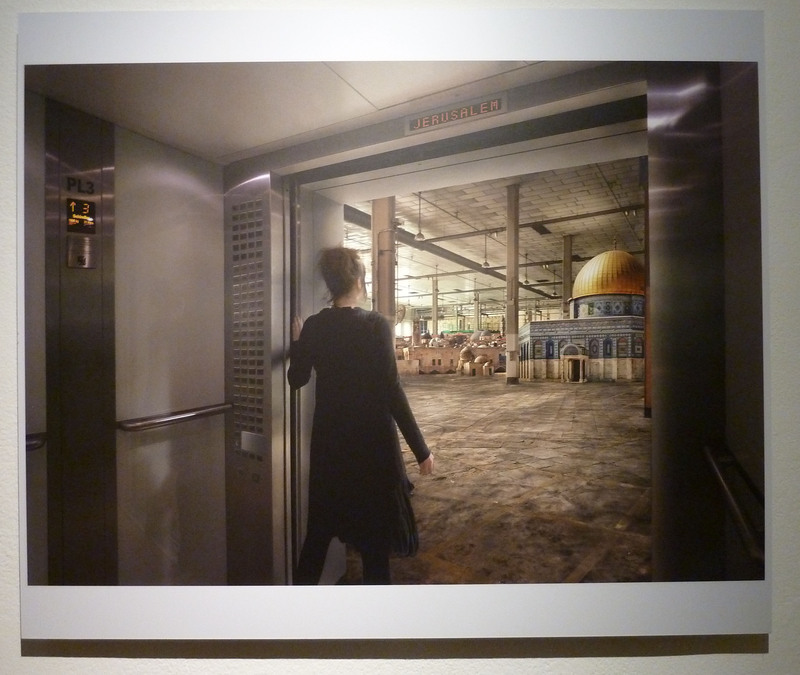 I particularly liked Larissa Sansour’s striking photographs. There are lots of video-based works and the top floor gallery is an immersive space for visitors to tamper with, that includes video games, a retro cinema and jigsaw puzzles. The venue has a project-space, experimental vibe to it. Cornerhouse feels like a cultural hub and I decided to stop for a late lunch and soak up the buzzy atmosphere. Larissa Sansour, Nation Estate – Jerusalem Floor. Own photograph. From there I was able to walk up the road to Central Library but unfortunately, in my rushed research, I had amazingly omitted to notice that it’s shut for a huge restoration project. From the tiny sections that weren’t covered in scaffolding I could see how beautiful the neoclassical circular space must be but, alas, there wasn’t much I could do so I hopped over the tram lines down Mosley Street to the Manchester Art Gallery. Manchester’s Central Library. Own photograph. Downstairs is A Sleek Dry Yell, 2008 by Haroon Mirza which uses everyday sound and objects to reassemble redundant analogue technology. Sound becomes sculpture although it echoes annoyingly around the entire building. Again, some of the permanent galleries were shut for re-hang but they have a great 18th century collection with all the usual suspects – Highmore, a very dirty Hogarth, Gainsborough, Romney, Reynolds… It’s a pleasant enough gallery but not too thrilling. 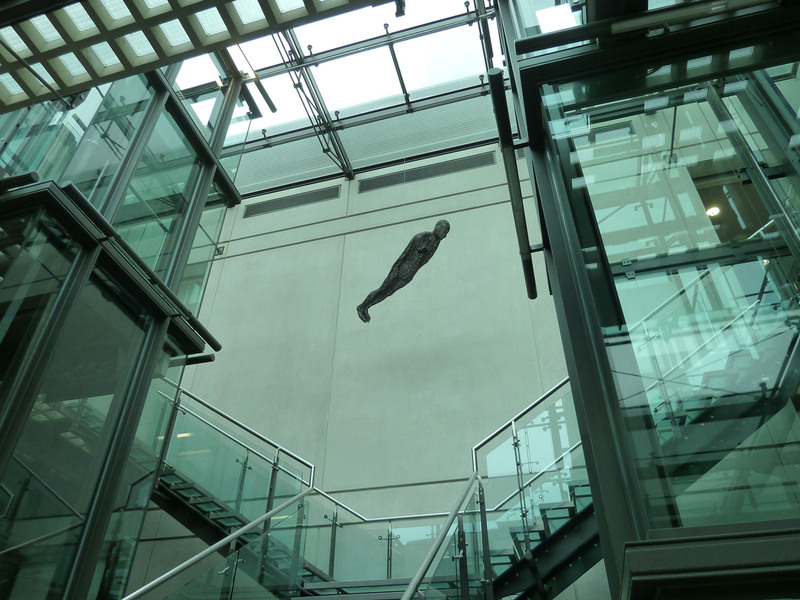 It is, however, a comprehensive collection and a much larger space that I expected partly due to a surprising modern extension at the back where Gormley’s Filter hangs from the ceiling; a figure (of course) made of welded steel rings showing the body as a container. The work hangs in space, open to light and the elements. The steel rings mean that the figure’s skin becomes porous so there is a fluid transition from internal to external expressing freedom of movement and experience. Antony Gormley, Filter. Own photograph. What the Manchester Art Gallery does well is present a small and manageable introduction to the various periods of art history with works by a number of key artists. I was constantly surprised by the calibre of some of the works but, equally, I was often disappointed by how they had paired them. The top floor presents a gallery of craft and design which was a bit too cluttered for my liking as well as an interesting exhibition of Roger Ballen’s photographs. I’m not sure why these things keep happening to me but I managed to approach this from the wrong side and was consequently surprised to find that this is his first UK exhibition and is, in fact, a huge retrospective. Ballen lived and worked in South Africa for over 30 years, exploring small rural towns with a different world and culture. His works have a stark black and white format which blurs the line between fantasy and reality in what he used to term ‘documentary fiction’. 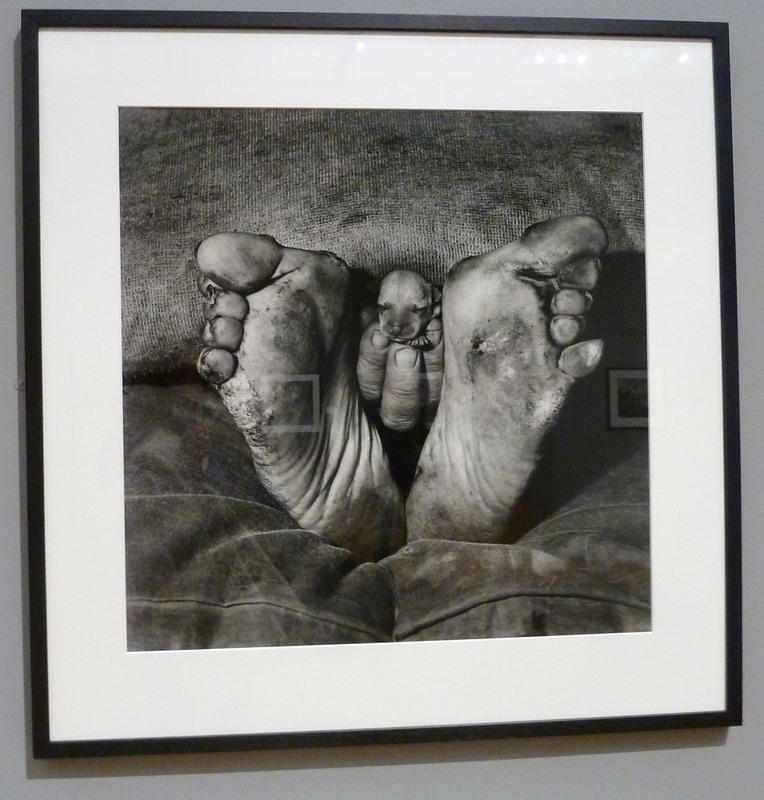 Roger Ballen, Puppy between feet. Own photograph. Rushing to avoid the impending rain, I headed to the John Rylands Library, a memorial building erected by Rylands’ third wife to house his 70,000 books and manuscripts. The building is thought to be one of the best examples of neo-Gothic architecture in Europe. Built as a chapel with stained glass windows rising from either end, the magnificent vaulted ceiling of the historic reading room demands awe and respect. Although the outside of the building is filthy, the interior is beautifully preserved and this was easily the artistic highlight of my day. 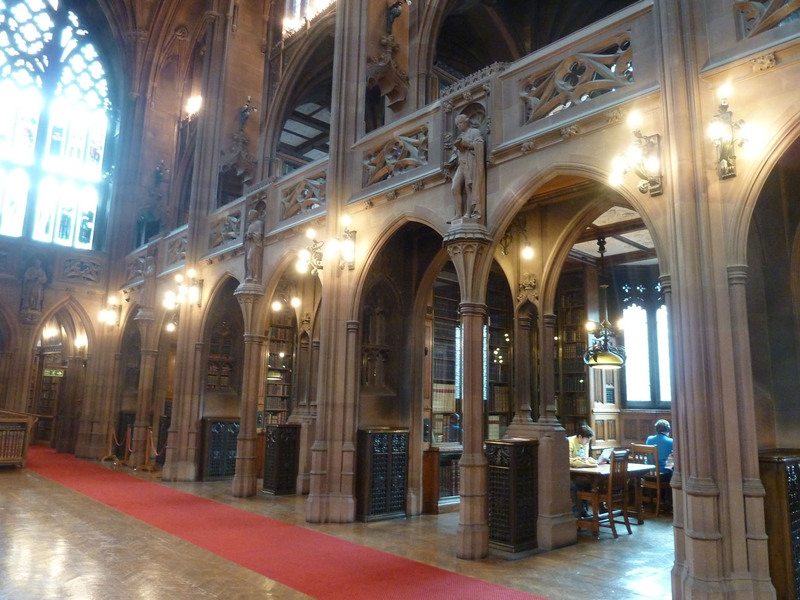 The historic reading room at the John Rylands library. Own photograph. 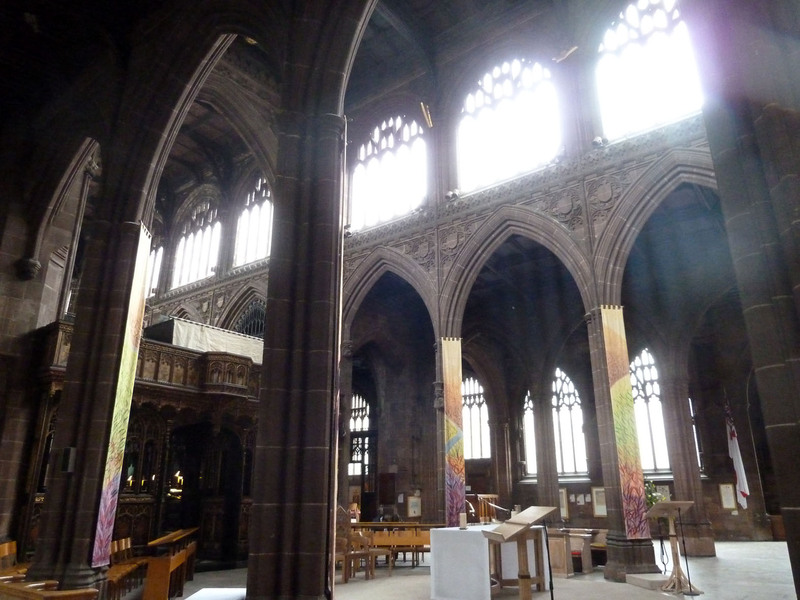 I wandered past the mega shopping area by The Royal Exchange and went to Manchester Cathedral. Building commenced in 1421 but it has undergone some fairly hefty restoration in its time. Although it’s a great building it couldn’t really compare with the library I’d just come from. I was lucky that there was organ practice while I was there so, once I’d looked around, I was able to sit and soak up the architecture while appreciating the acoustic splendour. Needless to say, by cocktail time I was becoming quite exhausted and my legs were suffering so The Alchemist was a perfect refuge. Thanks to google maps and my wonderful sense of geography I had managed to see everything without getting lost. I had only one thing on my list for the following day; I have no doubt that there is more to do and there are some gorgeous buildings on the outskirts of the city but I’ll have to save these for my next visit. 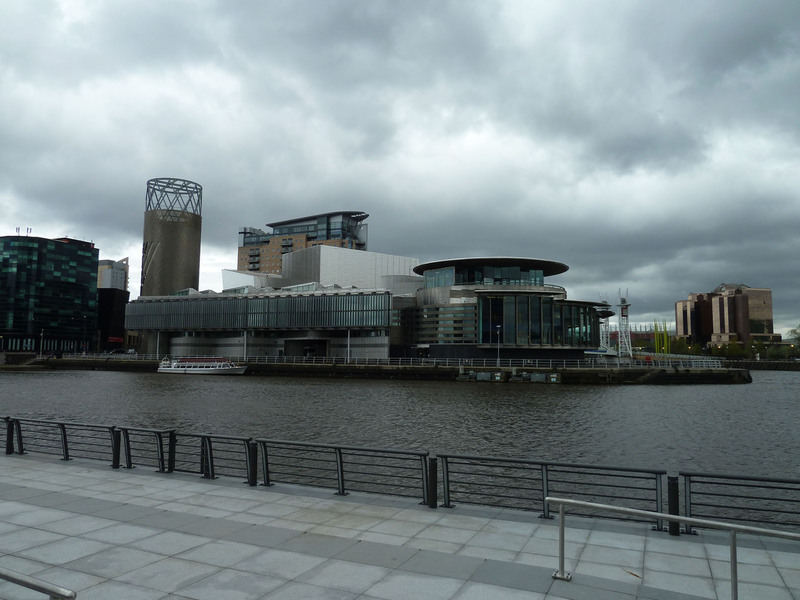 For my Manchester night out I headed over to the Lowry for Opera della Luna’s modern reworking of Don Giovanni, a comic portrayal of opera’s infamous lothario. The perfect end to my day! After exploring the canals of Salford on Saturday morning I popped back to the Lowry to see their exhibition space – after all you can’t come to Manchester and not have a true Lowry indulgence. 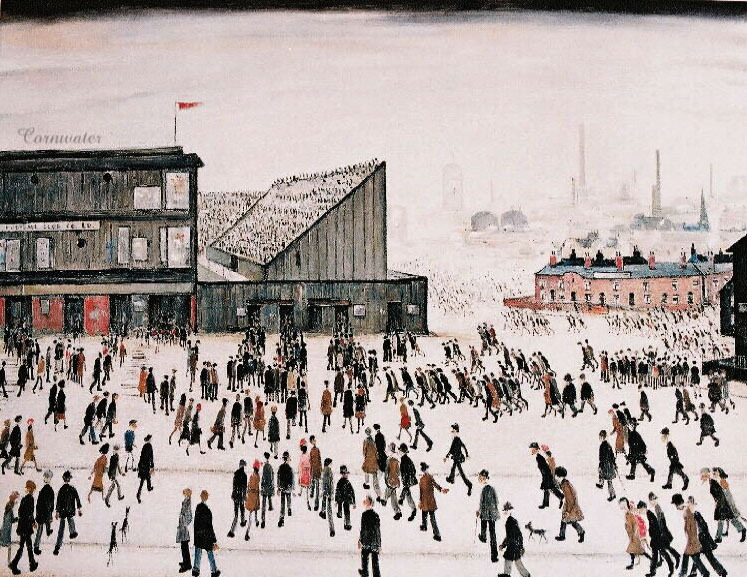 I have always loved Lowry so obviously I have a strong bias here but his works have such character, charm and life that it’s impossible not to love them. This is a really good collection and doesn’t just show the typical paintings for which he is popular. Also on display are a range of his beautiful seascapes inspired by the North Sea showing infinite open spaces, loaded with meaning and emotion. As Lowry grew older he became more and more fascinated with bizarre characters although some of his collectors found this surreal twist to his work too radical a departure. L.S. Lowry, Going to the Match. Image via www.thelowry.com. There is also an Annie Lennox exhibition offering insights into her life and career as a singer, songwriter, campaigner and activist. I’m not quite sure it fits here as there is no distinction between the spaces except for wall colour but Lowry Favourites and this are independently two very good shows. It was sadly time to leave Manchester and head back to the torrential rain in the South. Most of the buildings and galleries deserve far more attention than I’ve afforded them here but, due to the amount I somehow managed to cram in, I’ve tried to keep each section brief. I had a really relaxing and exciting trip and was fascinated to see some of Manchester that people don’t normally talk about or bother to notice. COTTON: Global Threads, Idris Khan: The Devil’s Wall and Victor Pasmore; Transformations are all at the Whitworth Art Gallery until 13th May 2012, www.whitworth.manchester.ac.uk. Subversion is at Cornerhouse until 5th June 2012, www.cornerhouse.org. Roger Ballen: Shadowland, Photographs 1983-2011 is at Manchester Art Gallery until 13th May, www.manchestergalleries.org. Lowry Favourites is at The Lowry until 6th July 2012 and The House of Annie Lennox is at The Lowry until 17th June 2012, www.thelowry.com. For more details about any of the other places visited see: www.victoriabaths.org.uk, www.manchester.gov.uk/directory_record/3962/central_library, www.library.manchester.ac.uk/deansgate, www.royalexchange.co.uk/page.aspx, www.manchestercathedral.org, www.operadellaluna.org and www.visitsalford.info.